I was very lucky recently to get the chance to see Jonás Cuaróns’ Año Uña, an inventive and challenging directorial debut from someone so young and new to the industry. All I knew about the film before the screening was that it used stills instead of moving images and there seemed to be a positive buzz surrounding the film in the press. This definitely seemed a film worthy of making the short trip to the Renoir Cinema. The film was preceded by the screening of two shorts films, A Moment, Twice by Donal Coonan and A Final Memory…Hope by Daniel Castro Garcia, which won the Año Uña competition. It was good to see these films as obviously I’m a big fan of shorts, but also they were a nice introduction to the feature we were about to see (almost like a warm up before we got started!). It was a nice touch by Jonás to get other filmmakers involved in the processes and ideas behind Año Uña and also give these filmmakers a chance to get screened. Año Uña was introduced by Alfonso Cuarón, the director’s father, who rather embarrassedly explained that his only involvement in the film had happened over 20 yrs ago, one dark night (although he does get an Executive Producer credit and I’m guessing he had something to do with the film’s envious sound department and ultimately, its cinema release). Cuarón Sr talked honestly about how when his son sat him down to watch his feature film, made entirely of stills, he instantly thought “uh-oh!”. He was probably right to be worried. On paper it’s difficult to comprehend how a 78-minute film, with no moving images, could hold an audience’s attention, but attentions were held, laughs were had and the people seemed enthralled. I won’t lie, the first 10-20 minutes were hard going and I was a little unsure if I was going to get into the film, but as characters developed and narratives unravelled, I was totally hooked. The story was so involving and the characters so believable, that I quite quickly forgot that I was only watching still photographs and if anything I started to feel as if I was really getting a ‘snapshot’ into the characters lives. However, in a way, this wasn’t a snapshot into the characters lives, but rather a snapshot into the director’s. For Año uña, Jonás Cuarón began taking photographs throughout one year, spontaneous images of people in their everyday lives, with neither posing nor staging. Jonás knew while taking the photographs that he would use them to make a film, but there was no plot because the recorded events followed the characters, themes and stories of the year. At the end of the year, Jonás and Eireann Harper completed an installation in which they mounted the thousands of photographic images in one room, ordered in scenes composed of shots. Consistencies began to emerge. Two people in particular reoccurred, Jonás’ girlfriend, Eireann, and his brother Diego. They became the narrative’s protagonists. So in truth these were documentary photographs, being used to make a fiction film, maybe Cuarón Jr has created a new genre of ‘Doction’. I have no reason to doubt the process behind Año Uña and if the director says that the photographs were taken with no posing nor staging, then I am totally inclined to believe this statement. With this in mind I was a little baffled today when one review referred to the film as ‘amateurishly acted’……strange! After the film the director and his girlfriend Eireann Harper (also the editor and main ‘actress’ of the film), spoke about the processes involved in making Año Uña and the first thing that struck me was the director’s idea of backwards filmmaking. With the majority of films, the director gets a screen play/story and develops the imagery around the narrative, however, with Jonás Cuaróns film this process was reversed. I find it really refreshing when directors choose to play with the language of film. Cuarón took a risk with his film and it was a brave move! 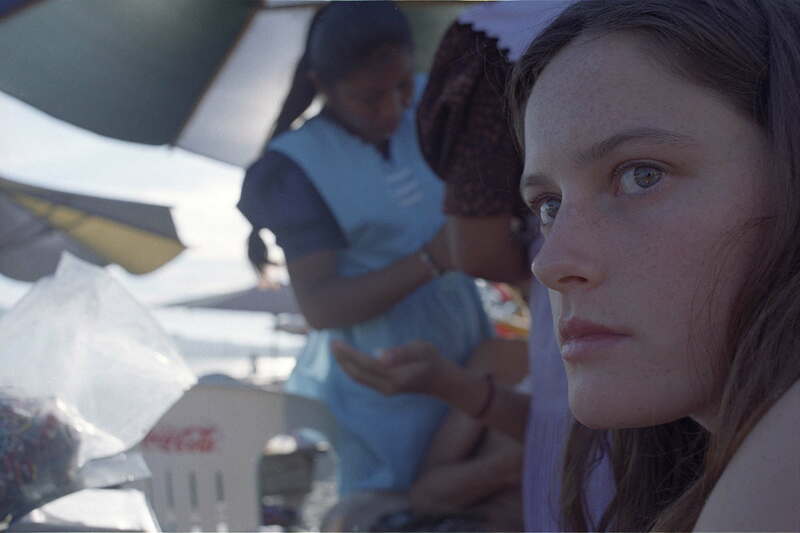 I’m sure Año Uña will be a Marmite film for many viewers; some will relish the challenging format and immerse themselves in the director’s vision, however, I’m sure some will dismiss it as far too art house for their liking. The one other thing that struck me about this film was how personal it was for the people involved in making it (well how can a film featuring photographs of your close family not be personal!). All filmmakers talk about how personal their films are and how they reflect their beliefs and views, however how many filmmakers use their own lives to create narratives? In a way, the plot of his film was decided by the path Cuarón’s life took over the year he shot the film. How would the film and its narrative have progressed if the director’s brother hadn’t visited New York or if his Grandfather hadn’t really died? In an industry where viewer/audience interactivity is becoming more and more important to the plots and stories of some filmmakers, surely it’s interesting to see how destiny our fate can control the process and Año Uña is surely a great case study for this. Año Uña will always draw comparisons with Chris Marker’s La Jetee and I’m sure many will see the film because of this link. However, I would encourage people to see this film because it is a shining example of how narrative, dialogue and sound can entertain, just as well as CGI or special effects (something I feel is important to remember in this industry). The film is also a great model for the low budget filmmaker, in essence, all Cuarón really needed to make his film was a stills camera and an editing system (Yes, I realise there was a lot more to his film than this – extensive sound design for one, but you see my point). Maybe as filmmakers we need to play a little more with the language of film and its processes, maybe we can all learn a little something from the Year of the Nail (the English title of Año Uña).